The conundrum of a lantern clock by Nichols Snowe of Salisbury dated more than thirty years after its maker died. An extraordinary lantern clock is pictured here, made in the early 1640s. At the time lantern clocks were the only kind of household clock, and were known as chamber clocks, or just clocks. The term we use today, lantern clocks, is relatively modern, beginning within about the last hundred years. In the nineteenth century, lantern clocks were sometimes called 'Cromwellian' clocks, a term which was at that time used to describe lantern clocks in general. This term is not used today because it is misleading, since lantern clocks were made long after Cromwell's time as well as during it. One can see how the term might have arisen, as the only clocks made during Cromwell's time were lantern clocks. All Cromwellian clocks were lantern clocks but not all lantern clocks were Cromwellian; apples are red but not all red things are apples. This article relates to one lantern clock that was made during Oliver Cromwell's time, but for a Royalist! This is a very intriguing clock. It is signed at the top and bottom of the chapter ring 'Nicholas Snowe in Sarum fecit', which is not the normal place for any lantern clock to be signed. No other lantern clock is recorded signed on the chapter ring in this upper and lower position, and no lantern clock of this (Cromwellian) period is known which is signed anywhere on the chapter ring . Just occasionally a 'late' lantern clock of the early eighteenth century may be signed on its lower chapter ring between VII and V, like a longcase clock, but that is almost a century later than this example. Nicholas Snowe (with an e) worked in Salisbury, where he was free in 1629 and where he died early in 1645. His brother, John, was also a clockmaker, but oddly enough John signed himself as Snow (without an e). This seems an odd situation at a time when a literate man would use a consistent spelling of his own name, yet these two did this regularly and consistently. John Snow worked roughly contemporaneously with Nicholas, and we deduce that he was Nicholas's brother, because Nicholas mentions him in his will, as 'John Snowe (with an e) my brother'. There is a faint possibility that by 'brother' he may not have meant his literal brother, but we cannot pursue that here. This clock is signed 'in Sarum'. The use of 'in' before the place was common at this period, or sometimes 'at' or 'of' or 'de'. Sarum is an old name for Salisbury, usually qualified as Old Sarum and New Sarum, and needs a bit of explaining. Old Sarum was an ancient town just north of present-day Salisbury and was abandoned in the fifteenth century in favour of Salisbury, which was sometimes called New Sarum. Apart from the clock pictured here only a single lantern clock is known by Nicholas Snowe. It is in Salisbury Museum and is signed 'Nicholas Snowe at Salsburie fecit 1636'. It seemed at first a bit odd that this present clock was signed at Sarum and his only other known lantern clock at Salisbury, even though they were different names for the same place. So I looked up what was known in the way of the other work by the Snow(e)s.
A hanging wall clock is known signed 'Nicholas Snowe 1638' without any placename, though we have no reason to doubt that Nicholas lived at Salisbury throughout his working life. Four, or perhaps five, lantern clocks are known by John Snow (spelled consistently without the e) and these are all signed without any placename and usually with a date - e.g.1630, 1646. Additionally three or four watches are known by him, two without any placename and one signed John Snow, Sarum. It is not known whether John Snow worked throughout his life at Salisbury, or only came there in his later years, perhaps after Nicholas had died (1645). So it seems the only other item by either of the Snow(e) brothers bearing a place name was also signed at Sarum. I pursued this question of Sarum a bit further. Oddly enough apart from his 1636 lantern clock signed at 'Salisburie', Nicholas consistently used the term (New) Sarum several times for his place of residence in his will written in 1644, the version of the placename on this present lantern clock. Why he should use Salisburie in 1636 and New Sarum in 1644, I cannot say, but he did. The only work of John Snow to have a placename terms it as Sarum. Nicholas's clockmaking son-in-law, Nicholas Langley, who died in 1674, also used the term New Sarum rather than Salisbury in his will, and used Sarum in his signature on a watch. His brother, watchmaker Robert Langley, also used Sarum in his will in 1668. I went in detail through Michael Snell's book 'Clocks & Clockmakers of Salisbury' and found that later Salisbury clockmakers who followed on from the Snow(e)s and Langleys, that is Samuel Tinham and the several members of the Wentworth family, all signed their work at Sarum, and so in fact did all successive clockmakers until the very end of the eighteenth century, when Salisbury first became the normal way of signing dials. Sarum seems to have been the recognised and traditional method, at least in the seventeenth and early eighteenth century. In fact apart from Nicholas Snowe's 1636 clock, I can't find any clockmaker who put the word Salisbury on his clock from the very beginning of clockmaking there for at least a century and a half. They all wrote Sarum. Whoever engraved the maker's name on this present clock, knew that place as Sarum and not Salisbury, and was following the regular and established practice of the period until the nineteenth century. 1. Overall view of the clock signed 'Nicholas Snowe in Sarum fecit' and monogrammed on the shield NS 1678. The normal method of signing a lantern clock in the 1640s was to sign it on base of the front fret. Occasionally they were signed on the upper dial centre zone, below XII, but on those with an alarm, as this one originally had, space was too limited in the dial centre and so front fret signing was normal. It can be seen by examination that this clock originally had different frets. The holes where they were once screwed into were neatly filled, presumably at the time the present heraldic frets were fitted, which I deduce was in 1678. They had to be filled as the present fret attachment holes overlap them slightly, and the original, square-headed holding screws, re-used for these present frets, could not otherwise have gripped properly. My assumption is that the clock was originally signed on its front fret with this same wording 'Nicholas Snowe in Sarum fecit'. The frets on this present clock are a popular West Country pattern (hardly ever used elsewhere) with lion and unicorn supporters supporting a shield, which is here used to display the monogram NS and the year 1678. NS could only stand for Nicholas Snowe, but he died in 1645, over thirty years before this proclaimed date. The clock can be seen by examination of all its features to date from the early 1640s, and therefore could very well have been made by, or at least during the lifetime, of Nicholas Snowe. So how could this pre-1645 clock come to be dated thirty-odd years after his death? My theory is as follows. The clock was converted from balance wheel (which was the escapement of all lantern clocks in the 1640s) to anchor escapement at an early date to improve timekeeping to the latest standards, the sign of early conversion being the very fine and decorative escape wheel arbor. My guess is that it was converted in 1678. If the person who carried out that conversion wanted to commemorate the year of that conversion by engraving it in a prominent position, there simply was not the space available for that. He therefore replaced the original frets with the present heraldic ones, which gave him space on the shield but left the original maker's name missing - but which he also wanted to commemorate out of respect. He therefore engraved the present 'signature' in the only space available on the dial, the upper and lower chapter ring, repeating his monogram NS with the year of conversion in the front fret, as we see it today. The signature on the chapter ring and the fret is clearly ancient, is in seventeenth century script and apparently in the same hand as the engraving on the fret shield. It is also signed in the 'correct' manner of the day 'in Sarum fecit'. These things are consistent with it being signed in 1678. We know that the anchor escapement was in use in clockmaking in this locality as early as 1675. A clock is known by Lawrence Debnam of Frome, made with the assistance of James Delaunce, and having an anchor escapement and to commemorate that, it too was dated - 1675. Frome is only a few miles up the road from Salisbury. If a solitary clockmaker in Frome knew how to make the anchor escapement in 1675, a whole cluster of closely-related clockmakers around Salisbury certainly must have known it by 1678 - even though the balance wheel escapement was still used for new lantern clocks for another generation or more. But there is perhaps further significance in the use of the West Country heraldic fret of the lion and unicorn supporting a shield. The earliest known dated clock with this fret (bearing in mind that most are not dated) was made in 1662 by William Holloway just up the road at Stroud - according the George White's excellent book 'English Lantern Clocks'. William Holloway of Stroud was born in 1633 at Market Lavington in Wiltshire, son of clockmaker John Holloway of that place, who almost certainly learned his craft from clockmaker John Snow of Market Lavington, who died in 1658 and was closely related to the clockmaking Snow(e)s of Salisbury - though the exact relationship is proving difficult to pin down. The inter-relationship of these earliest clockmakers in this region is almost incestuous. This heraldic fret is known to have been in use by 1662 and thereafter was very popular in the lantern clocks of this entire region until well into the early eighteenth century. It was probably in use as early as 1660, and by 1678 its use was almost exclusively universal in the region, outside of which it was rarely used. But this lion-and-unicorn fret, which we usually call the West Country one, is highly significant in that the lion and unicorn in that exact pose are 'supporters' (that is the technical heraldic term) of the Royal Arms of England. Occasionally the central shield of this fret even has the Royal coat of arms engraved on it, though more usually the shield is blank or carries initials. Quite a number of these particular frets have the Royal motto 'Dieu et Mon Droit' engraved or cast into them along the base. The very reason this fret was introduced at all must surely have been to express the sheer delight in this Royalist region at the restoration of the monarchy in 1660 in the return of King Charles II to the throne. And the significance of the Royalist sympathising is all the more apparent when we look at the two unique motifs engraved into the design of this otherwise typical floral dial centre of this clock signed by Nicholas Snowe, and which are known to appear on no other clock. In fact a lantern clock is known by Martin Snow of Wells, related to Nicholas Snowe, dated 1664, which uses this lion and unicorn fret and has the Royal Arms engraved in full. On the dial centre below XII, and worked into the typical surround of tulip-like flowers, is engraved a heart surmounted by a crown with at each side as a 'supporter' a bird, probably a dove. I pondered for some time as to what this might mean, thinking at first it was some sort of crest from a coat of arms. I tried to trace such a crest and failed. Eventually it dawned on me that it was symbolism expressing a love of , or support for, the crown, that is the monarchy, the doves presumably signifying in peace or by peaceful means - the monarchy at peace, a situation which was far from reality in the early 1640s when the clock was made, but which did, as it happens, pertain in 1678. By fitting heraldic frets with supporters of the Royal Arms, the clockmaker who converted this clock in 1678 was not only marking the clock's conversion to anchor, but was attesting to the fact that a stable and peaceful monarchy had actually arrived, a situation which was no more than a hope when the clock was made in the 1640s. Engraved at the base of the dial centre, just above the VI numeral, is another unique feature a stylised human face with long curling hair. A few early lantern clocks, earlier than this one, do carry a comic and stylised human face engraved among the flowers like a face peeping out between petals, but nothing at all like this one. He has both his eyes open unnaturally, each in a different manner, one horizontally and one vertically! Most extraordinary of all, he is wearing what can only be a gag! I can only assume this is meant to portray a Royalist sympathiser - to this day we picture Cavaliers with notoriously long hair compared to the pudding-basin crop of the Puritans. Perhaps it means something to the effect that as a Royalist sympathiser he sees far and wide but is bound to silence, or cannot speak about what he sees? His lips are sealed. 2. Detail of the engraved features in the dial centre, the Royalist sympathy and the gagged Cavalier. The style of the few known lantern clocks by John Snow and the one previously known by Nicholas Snowe are similar to each other and have certain features in common. One is the integral pillar castings which are very distinctive and include finials and feet in the one piece; another is the engraving style, which is very individualistic; another is the fret style, which is of a strapwork pattern usually carrying the maker's signature along its base (though the Snow(e)s themselves were contrary and did not sign their clocks on the fret base). Mechanically the clocks were like those made in London. This Sarum clock bearing Nicholas's name is totally different in these external aspects from any other Snow(e) lantern clock. It is in fact very close to London lantern clocks of the early 1640s, and also to the clock described below by Solomon Wasson. Solomon Wasson, the first maker of lantern clocks in Bristol, who was working from 1643, used similar castings and a similar engraving style to this Nicholas Snowe in Sarum clock, which was made at almost exactly the same time, probably within a year of each other. Both are very much like a London lantern clock of that day. Yet beginning within a very few years from the next known Bristol lantern clock onwards (about 1650), one of the features by which Bristol lantern clocks are recognised is the integral casting of the pillars. So this one Bristol clock, the oldest known one, differs from all others, in fact it precedes what really became the 'Bristol' style, yet is not denied as being a Bristol clock by Wasson. So does this clock by Nicholas Snowe of Sarum differ from the other Snow clocks in resembling London work, perhaps even using London castings. Perhaps the difficulty of life during these first years of the Civil War itself meant that clockmaking took a back seat. Perhaps Nicholas Snowe and Salomon Wasson were both obliged at this time to order their castings from London. Of course, the above deductions are pure speculation on my part, based on what we can see on the clock. Nicholas Snow(e) is not a famous maker. Indeed his name was barely known at all until about thirty years ago, maybe less, and even today only a dedicated collector of lantern clocks would even have heard of the name. If this clock was not made by him, what point would there have been in someone engraving his name on a clock in seventeenth-century style, after first removing the real (London?) maker's name and replacing the frets with those of the right period and region; engraving the placename correctly as 'in Sarum', unlike any other clock of his but exactly as was done by all other Salisbury makers of the day; on a clock which just happened to be of the right period (1642-45), when Snowe was alive and when the political turmoil of the land exactly matched the themes on this unique dial? And this at a time when a lantern clock of this vintage by any London maker would have been more prized than one by an unknown provincial one? Apart from such action making no sense, the knowledge did not exist thirty years ago (about engraving script styles, about the use of the word Sarum on dials, about fret patterns) for anyone to be capable of making such a decision. So, to speculate further, if this clock was converted to anchor in 1678, who might have done this? Who would have adopted such a fastidious attitude as to still give the original maker credit for the clock and leave his own name unstated? 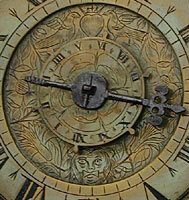 Most clockmakers upgrading a clock were keen to record their own name on the dial, or sometimes behind it. George White's books shows one example of an old clock on which William Holloway of Stroud engraved the fact that he 'made new' (i.e. rebuilt and modernised) the clock in 1687, and another example of a former balance wheel clock by Thomas Knifton of London engraved with the information that it was converted to pendulum by Richard Roe of Epperstone in Nottinghamshire in 1689. It must have been someone with a respect for the name of the maker, but who? I've spent a little time looking into the genealogy of Nicholas Snowe and his 'brother' John. John outlived Nicholas but died himself in 1661, apparently leaving no successor. Nicholas's own son, William, aged only seven when his father died, was brought up to be a clockmaker, as his father had wished. In his will Nicholas stated 'my will is that my workeing tooles belonging to my trade shall bee kept and preserved for the use and benefitt of my said sonne William Snowe, to whom I give and bequeath them, in casse that hee shall hereafter bee capable of my said trade and imploy himselfe therein'. We don't know who trained young William Snowe, but it could well have been his uncle John, who lived on till William was twenty three. So by 1678 both John Snow and Nicholas Langley were dead. The only close living relative of Nicholas Snowe who was in the trade was his son William at Marlborough, who worked there till his death in 1722 at the ripe age of eighty four. In 1678 William was just forty years old and the only surviving clockmaker from the immediate family, probably still using the work tools his father left him in his will. My bet is that it was he who up-graded this clock made by his late father for some Royalist supporter in the locality. Of course we will never know. How often we express the wish 'if only they could talk', and never more so than with a clock so full of mysteries as this one. But in this case its lips are sealed! A version of this article was originally published in Horological Journal.